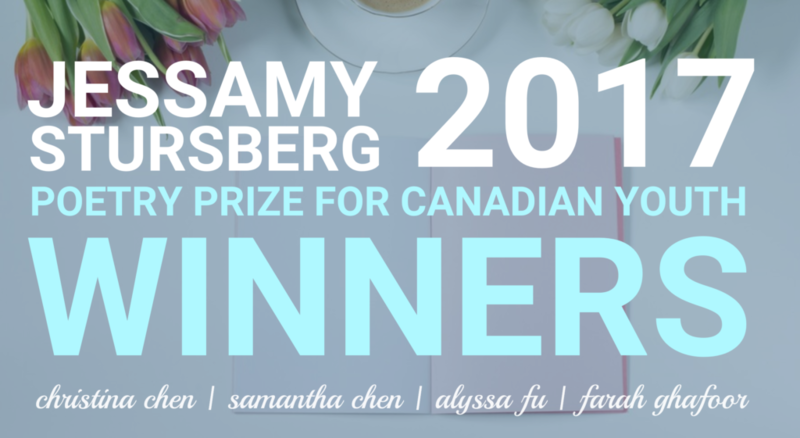 Congratulations to all the winners of our 2017 Jessamy Stursberg Poetry Prize! We were blown away by all the submissions this year, and we’re so excited to have the six winning poems published right here on our website. As an added bonus, we sat down with the four young writers behind the poems to learn a little more about them and their work. In a fun turn of events this year, in both the junior and senior categories, one poet authored both the second- and third-place poems! All submissions are blind, so we and our jurors were just as surprised and delighted to find out the final slate of winners as they were. Without further ado, let’s get to know poets Samantha Chen, Christina Chen, Alyssa Fu, and Farah Ghafoor! LCP: What do you like about writing poetry? Samantha Chen (“Gray“): My writing mostly revolves around what I think. Poetry is my outlet to share the things I cannot say out loud. My favourite part about poetry is that I can say anything I want and nobody can say it is wrong. Poetry can have many different meanings and many different ways of interpretation. I could write a poem about longing and sadness and somebody else might think it’s about love. I also really appreciate the fact that with poetry, I can tell my secrets for somebody else to find out about. Alyssa Fu (“Anarchy After the Barbershop B&E”): For me, poetry is a powerful form because it is a short way of conveying ideas, feelings, sensations, or just the beauty of the language. Farah Ghafoor (“The Moth,” “How to Look at the Sun“): I like how you can do something with your emotions that will make someone somewhere else in the world shudder or cry or smile or laugh. That reassurance that you are not alone in your feelings and thoughts is so, so important. It can be a step towards acceptance or be the fire under a rebellion and is so often both. After all, the personal is political, especially in this day and age when we are all trying to connect to each other through our mutual sorrows and joys. I also like writing poems because you can convey the same message in a shorter, concise form rather than trudging through a five-hundred page novel, chock with character arcs, settings, and sub-plots. I find it more difficult to write prose because of all these elements, but they are also why I have so much respect for writers and poets who have published book-length works. Many people think that it’s easy to write a book because technically, one just has to be literate, like an artist just needs some paint to be Van Gogh, even though there is so much planning, research, time and effort needed for it. Christina Chen (“Winter,” “Swollen“): What I like about poetry is the fact that it is an expressive form of writing. It has given me a way of showing emotion through words. LCP: How did you discover poetry? CC: I learned about poetry from my mom’s old bedtime stories. I spent my early childhood listening to her story poems that I always enjoyed. Just after a few stories, I was truly inspired to be a poet. SC: I became aware of poetry in the first grade, when all of my poems rhymed and were private jokes I had with myself. I didn’t really understand how powerful poetry could be until fifth grade, when I started to really understand its significance. FG: I discovered a haiku on the cover of my older sister’s summer workbook when I was in either first or third grade. I was awed by the way the poem described autumn so briefly but so beautifully, and decided to start writing my own. AF: From my English teacher, Mr. Young. LCP: What is your favourite subject in school? AF: Writing. When the school offers it, why not? SC: Although writing is one of my passions, English is not my favourite subject. This year’s curriculum consists of mostly analytical writing, which I don’t enjoy as much as creative writing. I would have to say my favourite subject is Math because I do some of my most confusing thinking in Math. In fact most of the time, I am absolutely lost, that I have to resolve to writing poetry about my complete and utter confusion. FG: I don’t exactly have a favourite subject but I do enjoy English, biology, and physics slightly more than my other classes. I’m able to read and analyze more books because of English class, I think the human body is pretty miraculous and interesting – there’s so much that could go wrong at all times and usually nothing does – and I don’t really know why I like physics. CC: My favourite subject in school is art. I like to be creative and to explore my ideas and feelings through making art pieces. The end result is always my own and unique to me. LCP: What is your favourite book? FG: Gosh, this question is always so difficult to answer. Off the top of my head, Six of Crows by Leigh Bardugo, The Book Thief by Markus Zusak, Throne of Glass by Sarah J. Maas, and the Harry Potter series by J. K. Rowling. To be clear, I haven’t read most of the books by my favourite poets (yet) but out of the ones I have read, I especially loved Fleshgraphs by Brynne Rebele-Henry, The Drunken, Lovely Bird by Sue Sinclair, salt. by Nayyirah Waheed, and everything Louise Glϋck has ever written. CC: My favourite books are in the Harry Potter Series. I absolutely adored this series because it was very imaginative, and it made me feel like I was in a world of magic. AF: My favourite novel is Pride and Prejudice by Jane Austen. I also like Brave New World by Aldous Huxley, and The Handmaid’s Tale by Margaret Atwood. SC: My favourite books are A Northern Light by Jennifer Donnelly and Shadow of the Wind by Carlos Ruiz Zafón. I enjoy these books in particular because they are both historical fictions and I find it specifically thrilling to read stories as if they were a part of the past. Also, this may sound cliché, but I really love romances. I would consider myself a sucker for a good love story. I love them because they make me wonder about who I might fall in love with in the future.